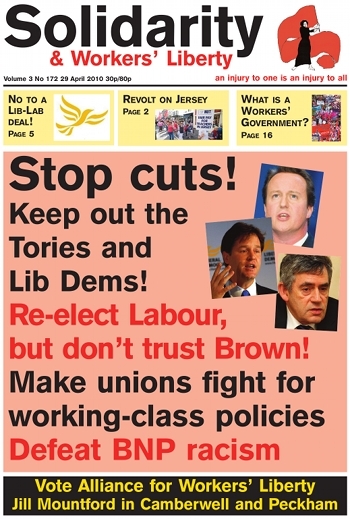 Vote Jill Mountford in Camberwell and Peckham and send a message to the bankers and bosses: workers will fight back! What we mean by a "workers' government"
General Election: help John McDonnell! Why is the BNP on TV? Stranded abroad by volcanic ash? Can't get to work? Tough! Against their coalitions, build our coalition! Will the Greek crisis spiral into default? EDL close down SWP meeting: rally to defend the left! The Alliance for Workers’ Liberty is standing in this election to raise the banner for socialism — to give some positive shape to the revulsion that working-class people feel about the way capitalism functions. We’re raising a set of ideas that oppose the idea that capitalism is the best humanity can do. We’re out at weekends and in the evenings talking to people on estates and on the streets about ideas that will radically change their lives for the better. Antonio Gramsci was a revolutionary Marxist of the early-1920s Lenin-Trotsky stripe. Yet his prison writings of 1929-35 have been used as a source for quite different politics. The British boss class are an ungrateful lot! Gordon Brown recently found that out when a phalanx of them came out very aggressively for the Cameron Tories. And after New Labour, and Chancellor and then Prime Minister Brown, had wholeheartedly and shamelessly served them and looked after their interests for 13 years! “The workers will prefer a coalition of labour parties which would guarantee the eight-hour day and an extra crust of bread. Shall we recline upon this soft cushion and take a good rest, or shall we rather lead the masses into the fight on the basis of their own illusions for the realisation of the program of a Workers’ Government? If we conceive of the Workers’ Government as a soft cushion, we are politically beaten. One of the most important constituency battles in this elections is going on Hayes and Harlington. There, John McDonnell, is defending a 10,000 majority against the Tories. John McDonnell is one of very few voices for organised labour in the House of Commons. If he were to lose then many non-affiliated unions such as the PCS, FBU, POA would in effect lose parliamentary representation, and many important trade union issues would never get raised in Parliament. The Croydon branch of the National Union of Teachers hosted a meeting for prospective parliamentary candidates on Wednesday 21 April. The speakers were sitting local MP, Andrew Pelling (Independent), and his Labour, Tory and Green challengers, a member of the Communist Party of Britain and Jill Mountford of the AWL. How should the working-class left respond to the general election and the cuts that are likely to follow, whichever party wins? Solidarity spoke to a range of activists (all in a personal capacity) from across the left. Sadly none of the major parties are really addressing the issues which matter to working people. The debate is framed in terms of what to cut and when as if that is the only choice. In Belgium the home affairs committee of the Brussels federal government has voted unanimously to ban the partial or total covering of faces in public places. The parliament is likely to approve the ban and it will be in force by the summer. In France Sarkozy looks set to use emergency procedures to push through a complete ban on the burqa (full-length head, face and body covering) and niqab (detachable face veil) in public places by July. The Canadian province of Quebec last week introduced a ban on facial covering in public service employment. A new popular term in Israel for the country is “IsraHell”. This is popular among some left-wing football fans, radicals and so on. You might imagine the term refers to the military occupation of the Palestinian territories, but actually it is something else. It refers to the depressing quality of life in the country for its mainly Jewish citizens as capitalism sinks deeper and deeper.